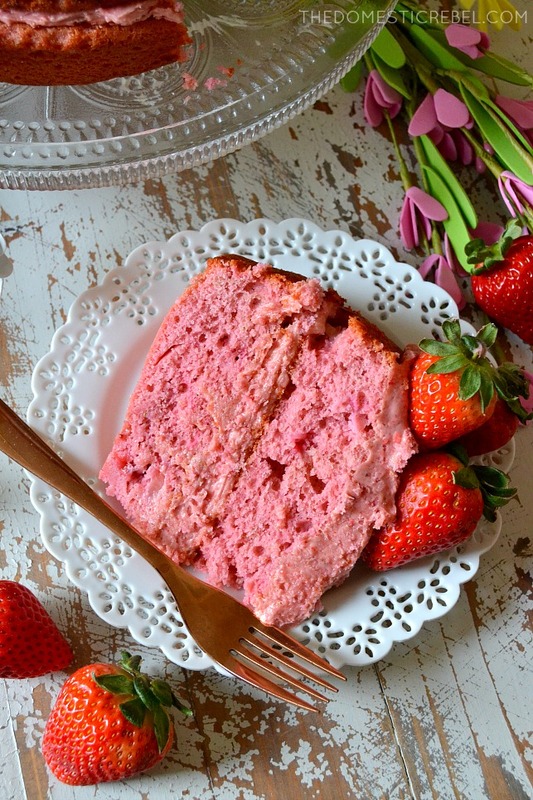 This Homemade Strawberry Buttermilk Layer Cake is so fantastic and perfect for spring and summer! Loaded with fresh berries in the moist and tender cake layers, it’s frosted with a luscious strawberry cream cheese icing! Sorry if you were expecting someone else. Anyway, I apologize for my LONG disappearance. I wish I could say I was pearl diving in Bora Bora or on safari in Zambia but I was at home, in my jams, working tirelessly on my cookbook. 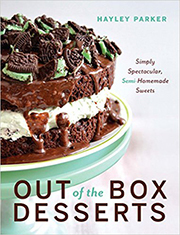 Oh yeah, if you didn’t know… I’m writing a THIRD cookbook all on Christmas treats. My studio basically looks like Kris Kringle threw up everywhere but in a cool, magical kind of way. My head has basically been buried in the sand this whole time as I work on this book. Basically, I started the book when I signed my contract around January 11 of this year… and the deadline to turn everything in is March 15! So I really only have about 2 months to write this thing, and lemme tell you – books are a labor of love. Emphasis on the ‘labor’ part. My dishwasher is working overtime. So I apologize for being gone so long and neglecting my blog for a good month and a half. I needed the break, but now I’m ready to finally start slowly incorporating some new recipes here. This is my official welcome back present to YOU! Oh, and before we dive into this cake, have you noticed some new changes around here? While I was MIA, I was actually behind-the-scenes with my graphic designer trying to create a new look for my site. I LOVE IT, and I hope you do, too. I feel like this new design is more user-friendly and easier to navigate. You’ll notice it’s a cinch to search for recipes using the drop-down menu, and the subscribe button is front and center for your convenience. 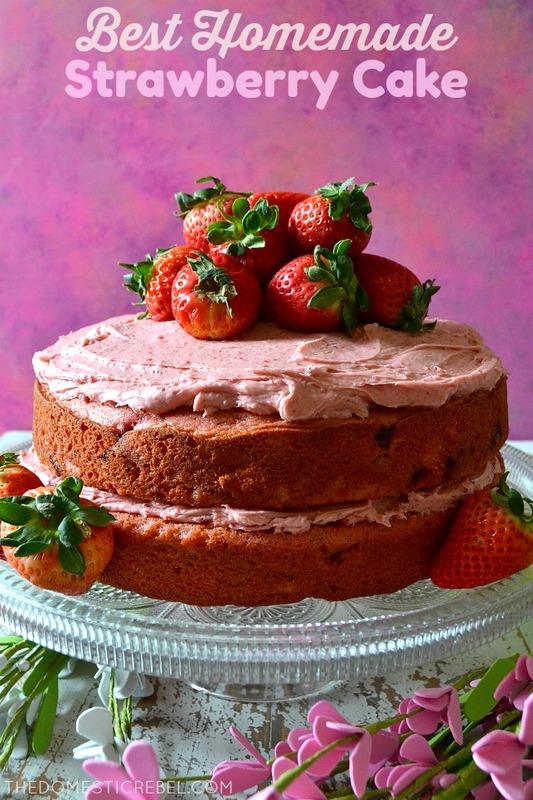 Strawberries are so gorgeous and plentiful right now, so I had to create something with this cheery, delicious berry: a homemade from scratch Strawberry Buttermilk Layer Cake. This cake is PACKED with flavor, is completely scratch-made, and is bursting with fresh, REAL strawberry flavor from actual strawberries. Nothing artificial here! My secret (and favorite) ingredient? Freeze-dried strawberries! 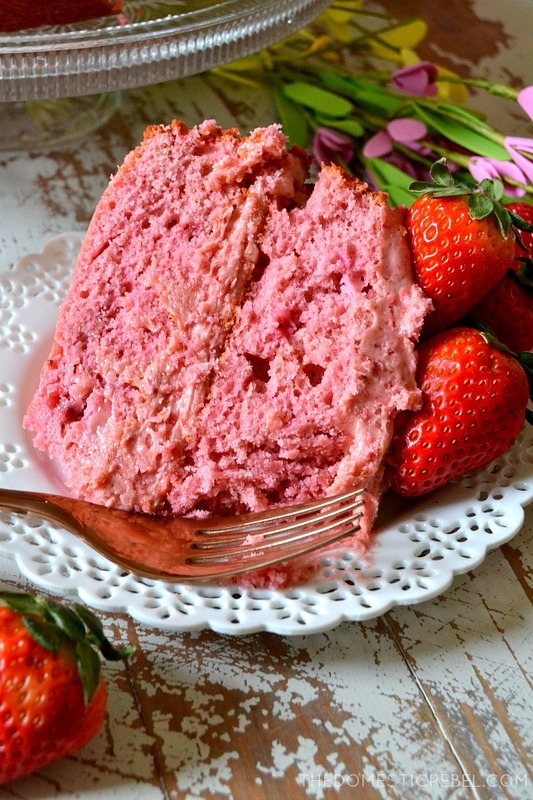 The result is a cake brimming with garden-fresh strawberry flavor with a moist and tender crumb. The frosting is a homemade strawberry cream cheese frosting that’s TO DIE FOR. Seriously, this cake received rave reviews from my panel of taste-testers, and one even declared it the “best strawberry cake I’ve had.” Score! 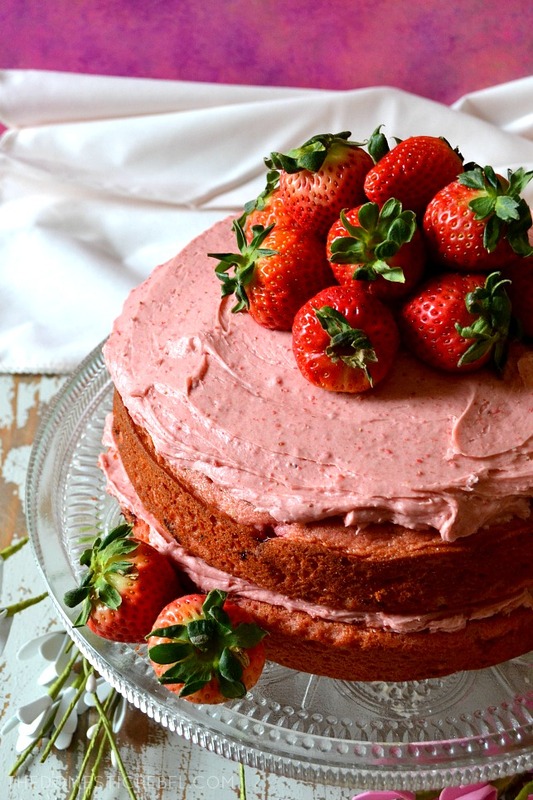 This Homemade Strawberry Layer Cake is the BEST I've tried! So much better than a boxed mix, it's fresh, flavorful, moist and tender with the most decadent strawberry cream cheese frosting ever! Preheat oven to 350 degrees F. Lightly spray the bottom of two 9" round cake pans. Place a parchment paper round in the bottom of each pan and spray the pan again on the bottom and sides. Set aside. In the bowl of a stand mixer, cream the butter, sugar, and freeze-dried strawberry powder together on medium-low speed until fluffy and combined, about 3 minutes. Gradually add in the eggs, one at a time, beating well after each addition. Stir the vanilla extract into the buttermilk, and alternately add half of the buttermilk, followed by half of the flour, and repeat until all the flour and buttermilk is gone. Fold in the chopped strawberries. Pour into the prepared pans, distributing the batter evenly. Bake for 30-35 minutes or until a toothpick inserted near the center comes out clean or with moist crumbs. Cool completely in the pan. For the frosting: In the bowl of a stand mixer, cream together the butter, cream cheese, and vanilla extract until fluffy and smooth, 2 minutes. Gradually add in the powdered sugar until frosting is light, fluffy, and spreadable. Beat in the freeze-dried strawberry powder. Place one cake round onto a platter or cake stand. Spread with half of the frosting. Top with the remaining cake layer, and finish it off with the remaining frosting. Garnish the top of the frosted cake with fresh whole berries. Serve immediately, or store leftovers airtight in the fridge for up to 3 days. Moist, fluffy and utterly irresistible, this cake packs a flavorful punch you don’t want to miss! Disclaimer: this post contains an Amazon affiliate link. If a purchase is made using my link, I receive a small commission at no additional cost to you. Thanks for keeping my blog alive! This cake is just beautiful! I’m making it this weekend. 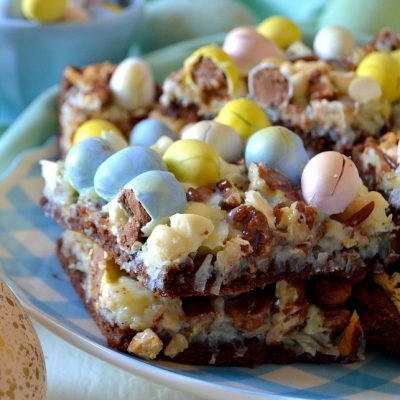 This looks so beautiful and delicious! I can’t wait to try it -thank you for sharing! Where do you get freeze dried berries? Live in Canada and I only see frozen berries. Hi Rhonda! I find my freeze-dried fruit at Whole Foods in their bulk and raw sections. At your grocery store, try looking on the trail mix/nuts aisles as well as in the fresh produce aisle. If nothing else, Amazon! 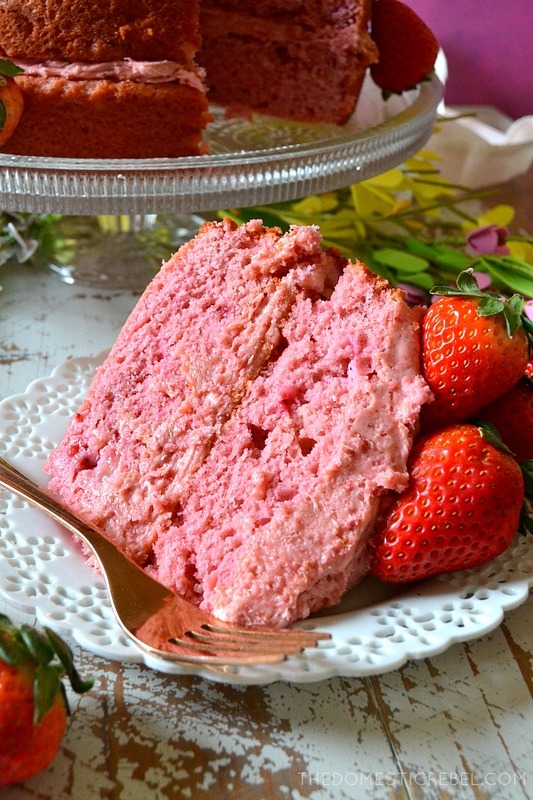 It is so refreshing to see a strawberry cake recipe not made from box mix and pudding mix!! Thank you! Hi Denise! I found them at Target on the nuts/trail mix aisle, but Whole Foods also carries them! Hi, Have you ever tried three layers instead of two? I haven’t but it would definitely work… the layers will just be thinner! 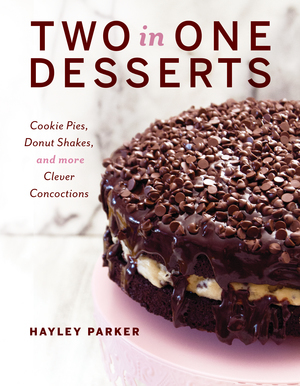 Would this recipe make 12 cupcakes OK? Oh, more than 12! More like 24 I’d think. Hi! I made this cake this weekend and it tasted great, but the cake was very dense. Not sure if I did something wrong. The batter was actually very thick too. Hi Rae, it is kind of a dense cake! What did the freeze dried strawberries do? Could I use all fresh? If so, how much would I use? Thanks. Hi Kathie, freeze-dried strawberries add such an amazing flavor. 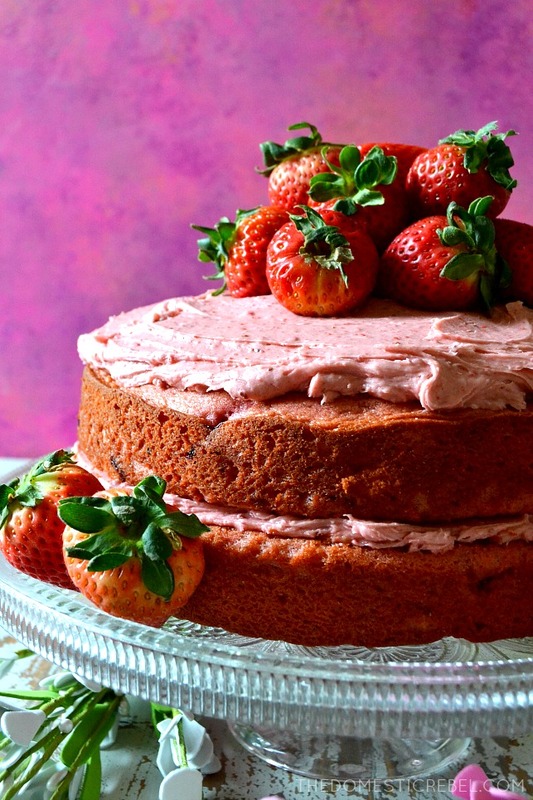 Fresh strawberries are too moist and would affect the final texture of the cake. However, the freeze-dried get ground into a powder that doesn’t affect the texture.